Product Description: Condition hair naturally with moisturizing botanicals and a delicious scent of blood orange and hyacinth. Ingredients: Water, cetearyl alcohol, fragrance, ceteareth-20, glycerin, phenoxyethanol, helianthus annuus (sunflower) seed oil, hibiscus sabdariffa flower*, mentha piperita (peppermint) leaf extract*, salvia officinalis (sage) leaf extract*, thymus vulgaris (thyme) leaf extract*, urtica dioica (nettle) leaf extract*, glycerin, behentrimonium methosulfate, stearalkonium chloride, potassium sorbate, citric acid, alcohol denat. *Organic. My Take: The smell is utterly delightful! 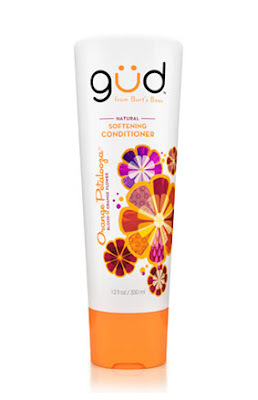 The conditioner is smooth and creamy and you kind of feel good using it because it's Burt's Bees, you know? It provided enough slip to detangle my hair while wet, but it was really the smell that won me over. As a conditioner it performed well, but it wasn't particularly outstanding.